A Drawing of the four manual Kirtland & Jardine built for St Peters Church, Mancheter, between 1856 and 1872, for Benjamin Joule, the fourth largest in England at that time. We are currently restoring the original parts from St Peters, which were transferred to St Brides Church, Old Trafford, in 1907. To be installed in St Catherine's Priory Church, Lincoln. 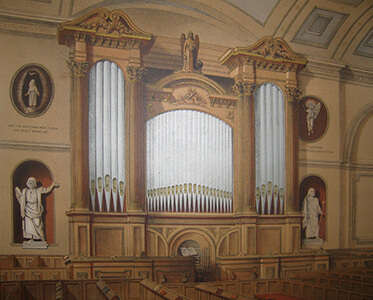 The original Swell, Great and Pedal will be used along with a choir organ, from our stock of Jardine pipework, The Casework will be constructed from one rescued, from St Edmunds Church, Whalley Range, Manchester. Organ under construction at St Catherine's Lincoln. During a storm in 2014, the Jardine organ in Sacred Heart church, Blackpool was damaged by falling masonry, a pinnacle from the tower dropped through the roof and exploded around the instrument. The organ was originally built for the Waterloo Cinema, Blackpool in 1921, an very early example of a theatre organ, it was moved to Sacred Heart church in 1935. With its original case and pipework. Jardine's were commissioned to repair and restore the instrument during 2015/16, the work was carried out with the intention of retaining as much of the original as possible, however as the pictures indicate, many of the swell department pipes were beyond repair, we did save some of the wooden and bass pipes however, the rest were completed from our stock of original Jardine pipes. Casework parts were made to pattern. The 11 rank organ in the Stockport Plaza was built in 1932 by the John Compton Co. One of the last examples in its original home and complete condition. It was damaged by underground utilities work in the adjacent Mersey Square, in around 2014. Jardines were commissioned to clean and restore the instrument in 2015, the brief was to retain ever original part we could, in fact we were able to source Compton magnets from 1931, close enough, these were to replace some later odd replacements, we also had to source some original cotton covered cable, to keep the wiring authentic. the instrument has its original electric switching, blower and belt driven generator. The pipework was cleaned, wind chests overhauled and re-leathered, the organ chambers were re-plastered and painted, The Stockport Plaza Trust also completed the ' toy counter' to the original specification. The building has been thoroughly restored to an original and high standard, well worth a visit.